One local resident has kept track of the amount of times trucks have hit the bridge near Bridgman and Howland avenues, at times causing hours-long traffic delays, since March 2018. 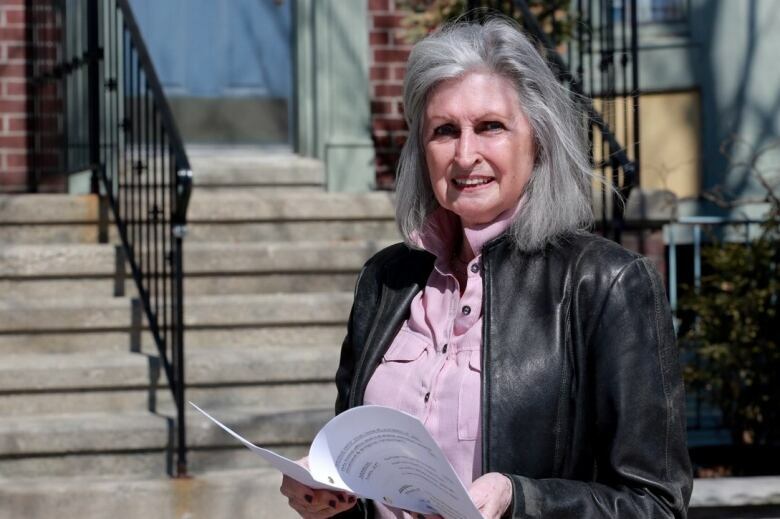 Morag Karlsson says it's a familiar sight from her second-floor window: oversized trucks ramming into a low rail bridge on Howland Avenue — and she has the stats to prove it. The Annex resident, who lives near the corner of Dupont and Bathurst streets, has recorded 35 accidents involving trucks and the bridge just south of Bridgman Avenue over the last year. "I've seen some very, very upset drivers," Karlsson told CBC Toronto. Karlsson said she has since handed over a document detailing the incidents to firefighters, police and her local councillor, in the hopes the city will take more action to stop drivers from hitting the 3.4-metre-high structure, which is about a metre lower than typical bridges of its kind. 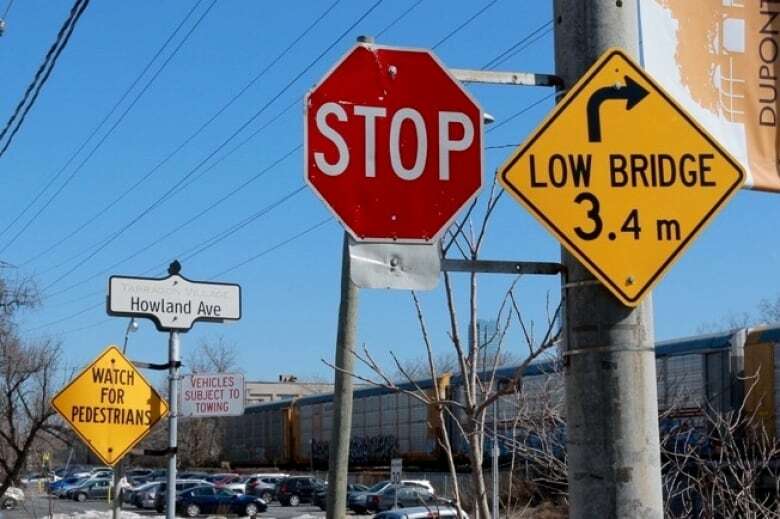 The bridge is operated by Canadian Pacific (CP) Railway, but the company said the city is responsible for its signage and drivers are responsible for obeying the signs. Signs at intersections on either side of the bridge notify drivers of its height. Flashing lights and yellow signs are also mounted on the bridge itself. 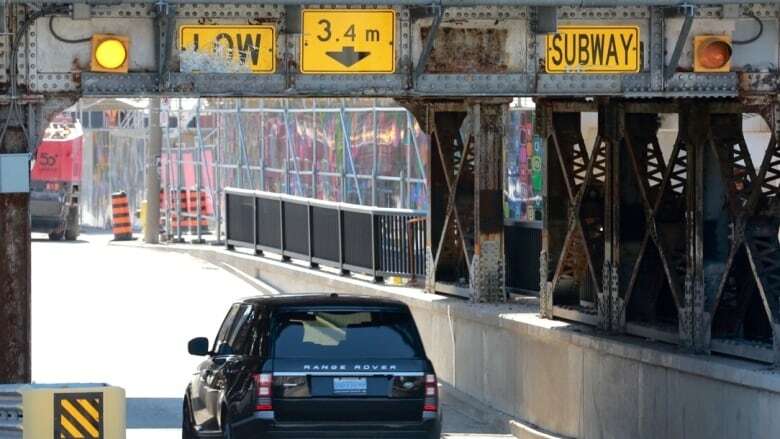 In a written statement to CBC Toronto, the city said staff regularly inspect bridges and that as recently as 2018, more signage was installed on and around the Annex-area bridge to make drivers aware of its low clearance. But Karlsson said the scuffed up signs are proof they haven't been effective. "They've been hit so many times you can barely see them," she said. Coun. Josh Matlow's office told CBC Toronto they contacted city transportation staff when they were made aware of the "dangerous situation." Matlow's office said the obstructed signage will be fixed in the short term and he has asked city staff to review and report back on options to make the bridge underpass safer in the long term. Karlsson said she has witnessed "dozens and dozens" of accidents throughout the nearly 20 years she's lived across the street from the bridge. But she only started tracking them in March 2018, after a garbage truck was ripped apart when it drove under the bridge. 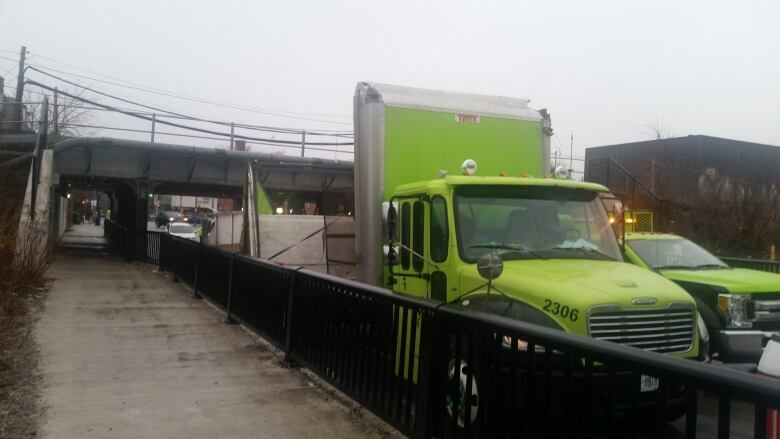 Anthony Rose, the owner Schmaltz Appetizing Toronto, a restaurant near the bridge, said he also sees about three or four trucks hit the bridge every month. "It's just a terrible thing but you'd think someone would put more signage up," Rose said, adding the bridge is the only one in the neighbourhood with low clearance. CP said the company halts rail traffic and dispatches an inspector when it is made aware of a vehicle hitting one of its bridges. Serious incidents have also closed Howland Avenue to vehicles for up to six hours, which creates "mayhem" in the area near Dupont and Bathurst streets during rush hour, Karlsson said. "I would like it to stop for the sake of everybody but I don't really know how," she added. 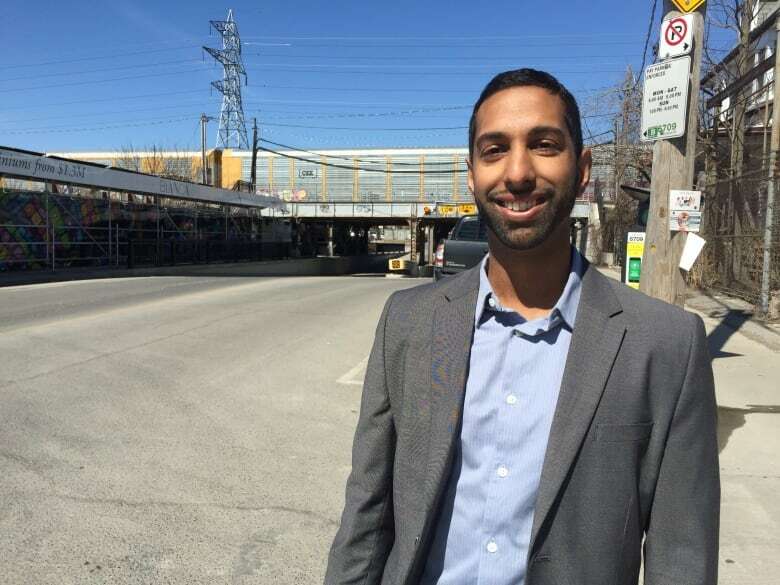 Transportation engineer Anil Seegobin said the city needs to take stronger measures to prohibit trucks in the area and reroute them to Bathurst Street and Spadina Road. Seegobin said the city should consider installing advance warning features, such as big overhead signs that alert truckers to the danger, or sensors that trigger brightly lit signage to alert drivers not to proceed. The one-metre difference in height is crucial but not always obvious to truckers driving toward it, he said. The responsibility, Seegobin said, is on both the city and drivers. "But again, if the bridge looks comparable to any other bridge, it may not alert the driver that there is a safety issue here," he added. 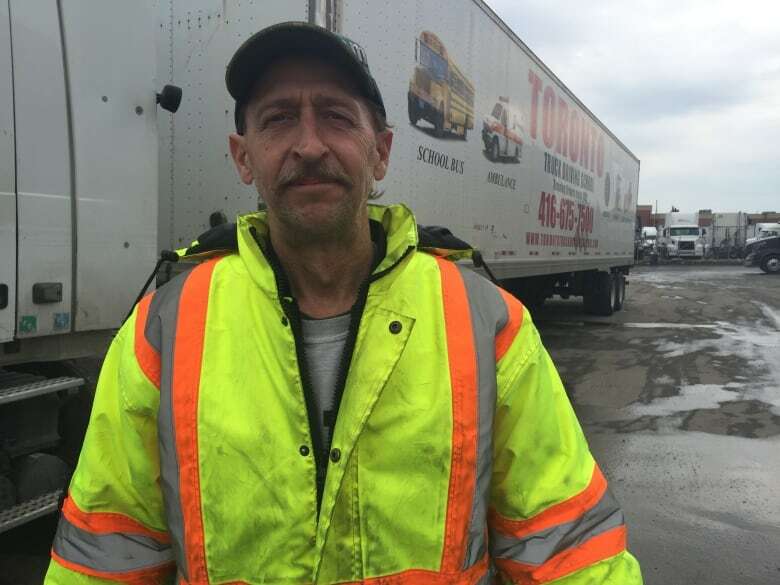 But truck driving instructor Troy Thompson said drivers are the ones responsible for their trucks and what happens to them. "Usually you plan the route and then you have the back-up route, on any job, anywhere, anytime — especially with trucks," said Thompson, who has been driving trucks for more than 20 years. He said drivers mistakenly take short cuts to save time and don't make their safety a priority. Thompson's advice is to always plan routes in advance. Planning keeps drivers, their vehicles and their licences safe, he said. "It takes you forever to get this licence," Thompson said. "It takes you five seconds to lose it."